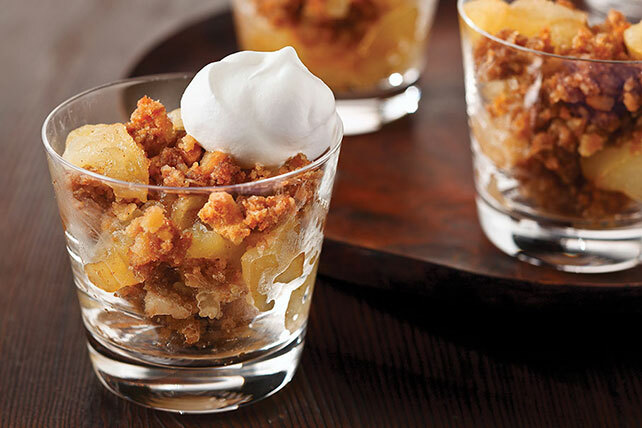 An apple crisp you can feel good about—with warm apples, cinnamon and sweet crumbs o’ vanilla wafer cookies. And yes: that IS a Healthy Living icon! Toss apples with 1/4 cup sugar and 1 tsp. cinnamon; place in 8- or 9-inch square baking dish. Combine oats, remaining sugar and cinnamon in medium bowl. Cut in margarine with pastry blender or 2 knives until mixture resembles coarse crumbs. Stir in wafer crumbs; sprinkle over apples. Bake 30 to 35 min. or until apples are tender. Serve topped with COOL WHIP. The best way to thaw frozen COOL WHIP Whipped Topping is in its container in the refrigerator. Depending on the size tub you have, the thawing time varies. Recommended thawing times are: 8-oz. tub - 4 hours; 12-oz. tub - 5 hours; 16-oz. tub - 6 hours. We DO NOT recommend thawing COOL WHIP Whipped Topping in the microwave.